We are lucky enough to live a few blocks away from a consignment shop. I visit every few weeks and always take a gander in the vintage linens room. Every now and then I get lucky - like the time I found a vintage hand-sewn red and white quilt for $8. We snuggle under that quilt every night now. Last visit I purchased these sweet crocheted-edge handkerchiefs (well, a little bigger than handkerchief) with embroidered flowers. You can click on the picture to see them larger and in detail. I simply folded these in half over a cotton cable cord and sewed close to the cord. Completed in less than 10 minutes and so sweet and spring-y! What a great find and how lucky you are to live so close to a shop like that. I love how you put the banner together. Very pretty! That is so pretty!!! What a great use of vintage linens. What an adorable way to use vintage linen. 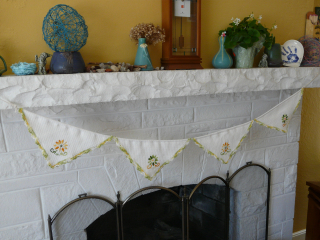 Your bunting is so pretty! A very happy St. Patrick's Day to you!